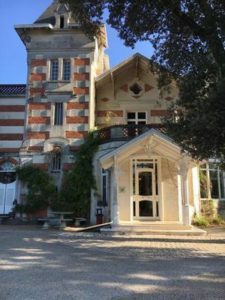 We are very excited to offer you the once-in-a-lifetime opportunity to see first-hand the unique Bonne Chauffe process up close at a family-run Cognac House. The distillation season is a fantastically festive time in the region, and the below two night itinerary is available mid-week and weekend from 1st November to 22nd December. Prices start at just £285 per person. Please call us on +44 (0) 1920 46 86 66 or e-mail info@grapeescapes.net to book your trip, or to request further information. Upon arrival in the picturesque Cognac region, check into a Superior or Deluxe room at the 4*Hotel de l’Yeuse, a charming 19th Century boutique property nestled in the vineyards a ten minute drive from the town of Cognac. After settling in, enjoy an introductory tasting session of three Cognacs by the fireside in the cosy setting of the hotel’s traditional Cognac library. After breakfast, you will be welcomed as the guests of a small, family-run Cognac House. Here, you will be taken on a full tour of the estate, seeing first-hand the fascinating Cognac-making process, including the rarely-seen Bonne Chauffe (the second Cognac distillation). Transfers will be arranged to and from the estate. 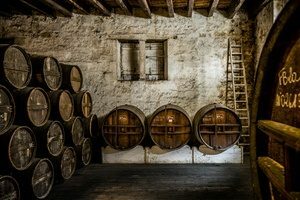 If you would like to visit one of the region’s famous Cognac Houses such as Rémy Martin, Courvoisier or Hennessy, we would be very pleased to provide prices for an afternoon tour. In the evening, delight in a delicious four course dinner in the hotel’s gastronomic restaurant. Please note that drinks have not been included as part of the package, and can be ordered and paid for locally on the evening. Nestled in the heart of the Cognac vineyards, Hotel de l’Yeuse is a charming 19th Century property offering a warm welcome and a pleasant stay in the Charente region. 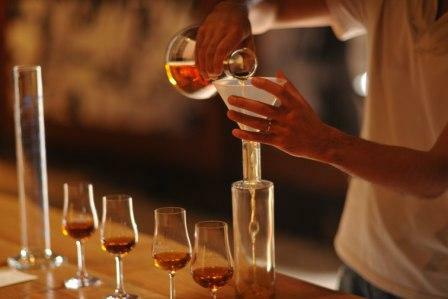 It is an ideal base from which to relax and enjoy the region’s Cognac houses and the beautiful town. ours’ drive. The hotel’s peaceful surroundings allow for a serene and restful stay in the region, whilst remaining close to the town of Cognac and world-famous Cognac Houses such as Rémy Martin, Camus, Hennessy and Courvoisier. 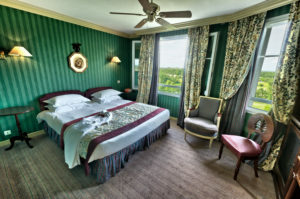 of the guest rooms offer a spellbinding panorama over the Charente Valley and its vineyards and villages. Each room is decorated elegantly and is equipped with satellite TV, WIFI internet access, Air-conditioning and heating, a mini-bar and en-suite facilities. 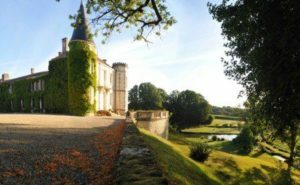 The total price of this package, based on 2 people sharing a twin or double Superior room is £285 (GBP) per person, and includes 2 nights’ accommodation with breakfast at Hotel de l’Yeuse, an introductory tasting session in the hotel’s Cognac library, tours and tastings at a small, family-run Cognac House with transfers and a 4 course dinner (excluding drinks). If you would prefer a Deluxe room at the hotel, a £20 per person supplement applies (total for the two night stay).